Upgrade your Cimatec 1 inch home filter system to the performance of an ECOairflow Model 1500, 1010 or 1000 and reduce your heating, air conditioning and electrical costs up to 15%! Advanced carbon graphite string or plain fiberglass filter media can remove particles as small as .007 microns from your indoor air! This new fiberglass media has a pressure drop of only 0.18 inches w.c. @ 300 fpm for up to MERV 12 filter efficiency! Fiberglass is more effective and safer for the environment ! 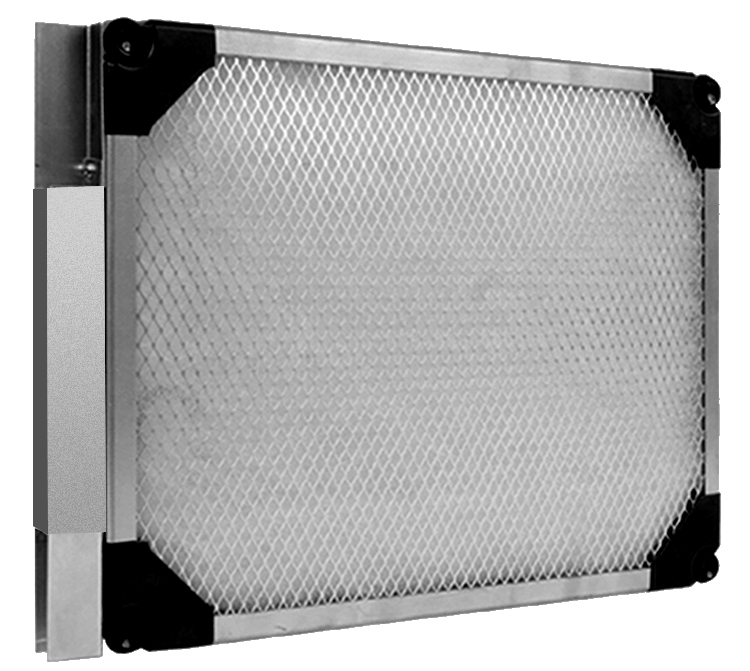 Fiberglass does not compress it rebounds in your Cimatec filter frame for a perfect fit. When you change your filters, put the old filter media in a paper bag, and it will turn back to the minerals it was made from in your local land fill. This #1 Quality Replacement Furnace Filter Media Fits: AMANA A1EAC, GOODMAN G1EAC, ESSA, MAYTAG M1EAC, Respicaire, Sears BP1 - 2, Sears Kenmore, Totaline Star Series CG1000. SAVE 20% when you buy 3 filter media packs! Replacement weave bonded fiberglass filter media pads for the EcoAirflow Model 1000 and CIMATEC Airscreen 1000 or 2000 Home Electronic Filter Systems, new style with plastic pop-up corners. This fiberglass filter media is UL plenum flame test rated. Eight (8) pieces (4 filter changes) in original consumer plastic overwrap packaging. Made in USA. BEST WAY! BEST VALUE! EcoAirflow PRODUCTS SHIP EXCLUSIVELY by UPS Ground! 12" x 24" 14" x 14" 14" x 17" 14" x 20" 14" x 24" 14" x 25" 14" x 30" 15" x 20" 16" x 16" 16" x 20" 16" x 24" 16" x 25" 17" x 21" 18" x 20" 18" x 24" 20" x 14" 20" x 20" 20" x 24" 20" x 25" 20" x 30" 24" x 24" 24" x 30" 25" x 25" 30" x 32"
3 AIRSCREEN FILTER MEDIA PACKS! Save 20% off our regular price! Replacement weave bonded fiberglass filter media pads for the EcoAirflow Model 1000 and CIMATEC Airscreen 1000 or 2000 Home Electronic Filter Systems, new style with plastic pop-up corners. This fiberglass filter media is UL plenum flame test rated. Eight (8) pieces (4 filter changes) in original consumer plastic overwrap packaging. Made in USA. $85.95 BEST WAY! BEST VALUE! EcoAirflow PRODUCTS SHIP EXCLUSIVELY by UPS Ground! Replacement weave bonded fiberglass filter media pads for the old style CIMATEC Airscreen 1000 or 2000 Home Electronic Filter Systems (opens like a book with two metal clips). This fiberglass filter media is UL plenum flame test rated. Eight (8) pieces (4 filter changes) in original consumer plastic overwrap packaging. Made in USA. $35.95 BEST WAY! BEST VALUE! EcoAirflow PRODUCTS SHIP EXCLUSIVELY by UPS Ground! 12" x 24" 14" x 14" 14" x 17" 14" x 20" 14" x 24" 14" x 25" 14" x 30" 15" x 20" 16" x 16" 16" x 20" 16" x 24" 16" x 25" 17" x 21" 17.5" x 17.5" 18" x 20" 18" x 24" 20" x 14" 20" x 20" 20" x 24" 20" x 25" 20" x 30" 24" x 24" 24" x 30" 25" x 25" 30" x 32"
3 AIRSCREEN FILTER MEDIA PACKS! Save 20% off our regular price! Replacement weave bonded fiberglass filter media pads for the old style CIMATEC Airscreen 1000 or 2000 Home Electronic Filter Systems (opens like a book with two metal clips). This fiberglass filter media is UL plenum flame test rated. Eight (8) pieces (4 filter changes) in original consumer plastic overwrap packaging. Made in USA. Replacement patented high efficiency Electro-Fibre(tm) filter media for the Aircleen 1500 Home Electronic Filter System (also fits Airscreen 1300 Systems). This fiberglass filter media is UL plenum flame test rated. Eight (8) pieces (4 filter changes) in original consumer plastic overwrap packaging. Made in USA. $49.95 BEST WAY! BEST VALUE! EcoAirflow PRODUCTS SHIP EXCLUSIVELY by UPS Ground! 3 AIRSCREEN FILTER MEDIA PACKS! Save 20% off our regular price! Replacement patented high efficiency Electro-Fibre(tm) filter media for the Aircleen 1500 Home Electronic Filter System (also fits Airscreen 1300 Systems). This fiberglass filter media is UL plenum flame test rated. Eight (8) pieces (4 filter changes) in original consumer plastic overwrap packaging. Made in USA. $119.95 BEST WAY! BEST VALUE! EcoAirflow PRODUCTS SHIP EXCLUSIVELY by UPS Ground! Replacement weave bonded fiberglass filter media pads with carbon strings for the EcoAirflow Model 1010 Contractor Grade Home Electronic Filter System. This fiberglass filter media is UL plenum flame test rated. Eight (8) pieces (4 filter changes) in original consumer plastic overwrap packaging. Made in USA. 3 AIRSCREEN FILTER MEDIA PACKS! Save 20% off our regular price! Replacement weave bonded fiberglass filter media pads with carbon strings for the EcoAirflow Model 1010 Contractor Grade Home Electronic Filter System. This fiberglass filter media is UL plenum flame test rated. Eight (8) pieces (4 filter changes) in original consumer plastic overwrap packaging. Made in USA. This page Copyright © 2019 by EnviroKnowHow.